Coming into the year there were a lot of comparisons between Schlenker and one of the best Illinois girls ever: Katelynne Hart. As a junior high runner Schlenker tore up the scene running some great times of 60.98 in the 400m, 2:16.24 in the 800m, 4:59.57 in the 1600m, 10:58.10 in the 3200m, and 10:57.7 in the two mile. Expectations were high for the young runner and she did not disappoint. She got her feet wet on the high school level for the first time at Detweiller At Dark taking 5th place with an impressive 17:19.1. This was a great learning curve as Schlenker had to adapt to running with competition that could finally match her talent. 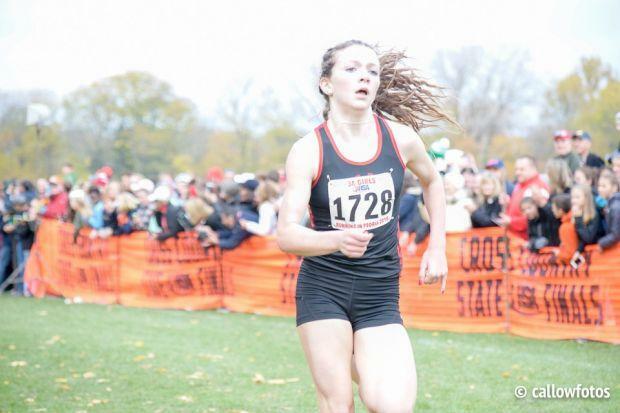 She showed how she grew from Detweiller At Dark into the great runner she is with major wins at the First to The Finish Invite, the Minooka Flight Invite, the Bartlett Flyin' Hawk Invite, and the DuKane Conference meet during the regular season. Schlenker's best race during the regular season had to be at the Naperville Twilight Invite. The freshman stud took 2nd place behind Katelynne Hart by about 18 seconds, but in doing so she beat a returning all-American in Alex Morris of Naperville North. This was a real eye-opener, seeing her defeat one of the nation's elite. The crazy thing is that she did it another three times during the year including her best performance to date at the state meet. She ran the fastest time by a freshman girl in Illinois high school history in the 3 mile by running a 16:07. She was chasing KK Hart and was only four seconds behind her until Hart put another 4 seconds on her in the final mile. She put her name up there with Hart and we could possibly see a Hart-Michelin battle this year between Hart and Schlenker during track. Morris has also thrown her name in there as well. Congrats to Schlenker as she is the 2018 Milesplit IL Girls Freshman of The Year!